When I first tasted handmade orecchiette in the Apulia region of southern Italy, I had an epiphany, one of those moments when you know you’re tasting “the real thing.” As soon as I bit into one of the irregularly shaped rounds (orecchiette means “little ears” in Italian), I was hooked. The slightly chewy disks were the perfect foil to the robust sauce they were tossed in, made from bitter broccoli raab, fragrant garlic, and salty anchovies. The pasta’s cupped shape held drops of the sauce, while its sturdy texture kept it from getting soggy. What set these orecchiette apart from the storebought kind I’d been eating for years was their fresh flavor and firm yet yielding texture. This pasta was more than simply a vehicle for transporting sauce; it was an equal element of the dish, as important as the sauce itself. I knew that once I got home, I’d be making my own. 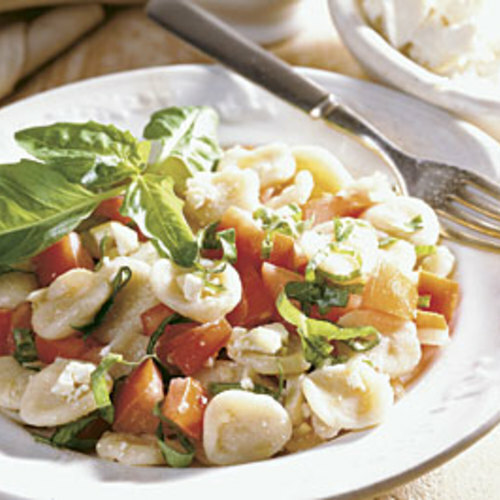 Fortunately, orecchiette (pronounced or-eh-KYEH-tay) are simple to make. Like people, pasta varieties are products of their environment. Just as the fertile Italian region of Emilia-Romagna has provided the world with rich tortellini, the more rugged Apulia has given us sturdy, no-nonsense orecchiette. 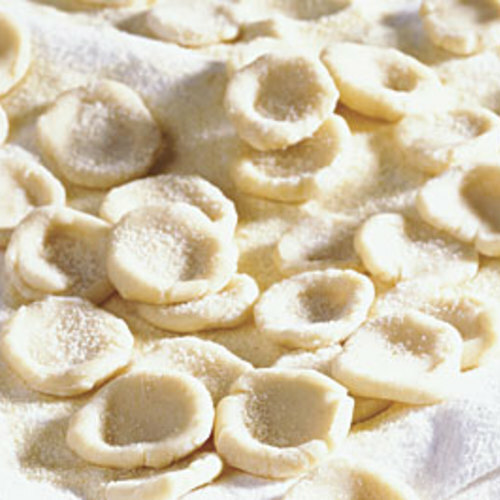 Unlike most homemade pastas, which contain eggs, orecchiette are made from just flour and water. The lack of eggs and the use of semolina flour, which is harder than white flour, contribute to the pasta’s pleasingly firm bite. I blend the semolina with all-purpose flour. You can find semolina flour, which is made from hard durum wheat, in many supermarkets and specialty food stores, or you can order it from sources such as Dean & DeLuca in New York or Butte Creek Mill in Oregon. The dough is made like any other pasta dough, by shaping the flour into a well, putting the liquid in the middle, and very gradually working in the flour with your fingers or a fork. The surprising difference with this dough is that you use warm water, not cold. 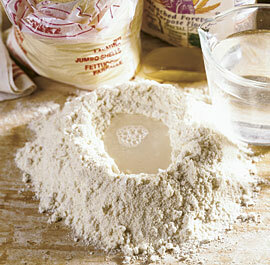 The warm water will help to develop more gluten in the flour, making it very elastic. After the dough is mixed, it needs at least seven minutes of serious kneading. 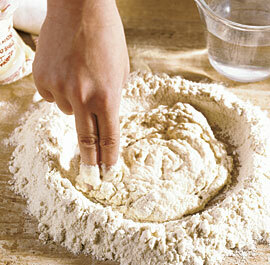 As you knead, the dough may crumble a little; if it does, just wet your hands lightly and continue working. Like most homemade pastas, orecchiette dough begins with a well. But this pasta contains just water and flour, and some of the flour is semolina. Use your fingers to mix the water and flour. Add the water a little at a time until you have a soft, sticky dough. 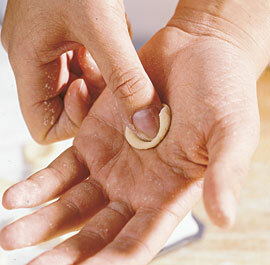 Orecchiette are easy to shape, but each “ear” must be shaped individually, which takes a little time. 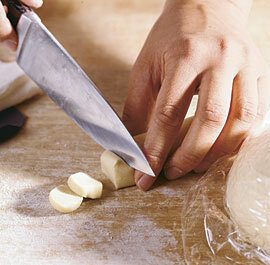 The dough dries quickly, so work with one piece at a time, keeping the rest covered with a towel or plastic wrap. The basic method for shaping the ears is to dimple a small, flat round of dough with your thumb to make a tiny cup or ear. The key is to twist the hand holding the disk of dough, not the thumb that’s making the indentation. By the end of a batch of dough, you’ll have the technique mastered. And remember that part of orecchiette’s charm is the irregular shapes. Roll a golfball-size chunk of dough into a log and slice it into thin rounds. Keep the rest of the dough wrapped so it won’t dry out. A couple of swivels of your hand gives the pasta a cup shape. By pressing down with your thumb, you’ll make the center a little thinner than the rim. You can cook orecchiette immediately while the pasta is still moist, or you can air-dry it until it’s hard and store it for at least a couple of months. 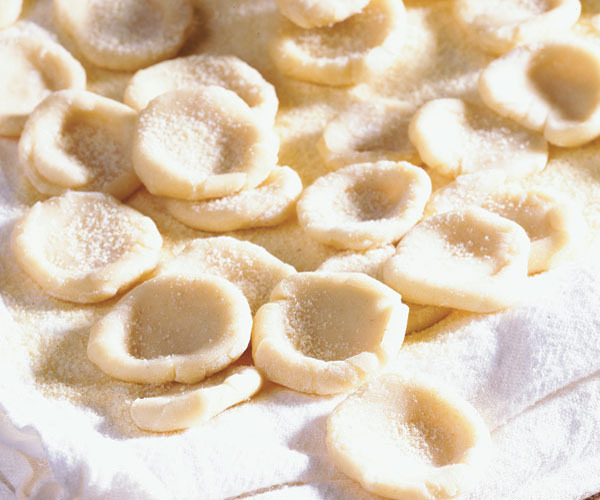 To dry the pasta, spread the rounds out on floured baking sheets and leave them at room temperature. The time they take to dry depends on humidity and the character of the dough itself, but you should let them dry at least overnight. When they’re so hard that you can’t slice them with a knife, transfer them to covered jars and store them at room temperature. Because orecchiette don’t contain eggs and they’re made with hard flour, even a freshly made batch takes longer to cook than homemade egg pasta— about 8 minutes for fresh, 20 minutes for dried— something to keep in mind when you’re preparing the quick sauces I offer here. 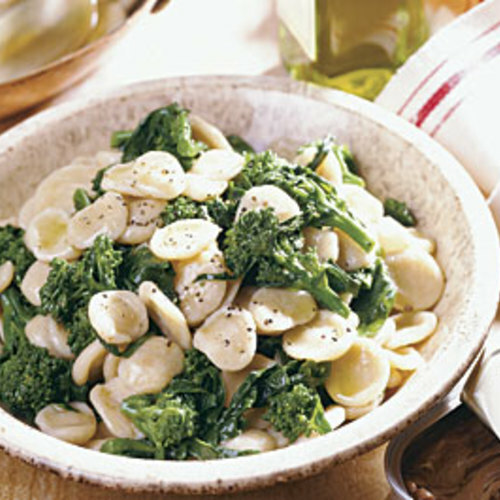 Orecchiette complement most sauces, but those with assertive flavors work best with the pasta’s substantial texture. Because orecchiette don’t contain eggs and they’re made with hard flour, even a freshly made batch takes longer to cook than homemade egg pasta— about 8 minutes for fresh, 20 minutes for dried— something to keep in mind when you’re preparing the quick sauces I offer here. 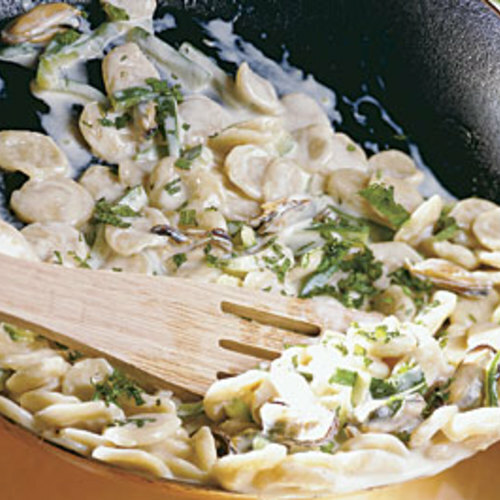 Orecchiette complement most sauces, but those with assertive flavors work best with the pasta’s substantial texture. As with any pasta, use lots of vigorously boiling, generously salted water. The pasta should be cooked through but still have a firm bite. I’ve found there’s only one foolproof method for determining when orecchiette are done—taste several and taste often. When the pasta is done to your liking, drain it and immediately toss it with your sauce. I don't meant to offend anyone, however this article is culturally incorrect. First of all, the pronunciation of the word 'oricchiette' is wrong. Secondly, the method for creating the shape is wrong. If you had done proper research, the traditional way to roll form the pasta shapes involves dragging a knife along a bit of dough and folding it with your finger. This is the way to create authentic pasta. Call me petty, but claiming to be an expert in something you. obviously have little knowledge in isn't a great idea.